Watch a PlayStation 4 playthrough of next month's demo. 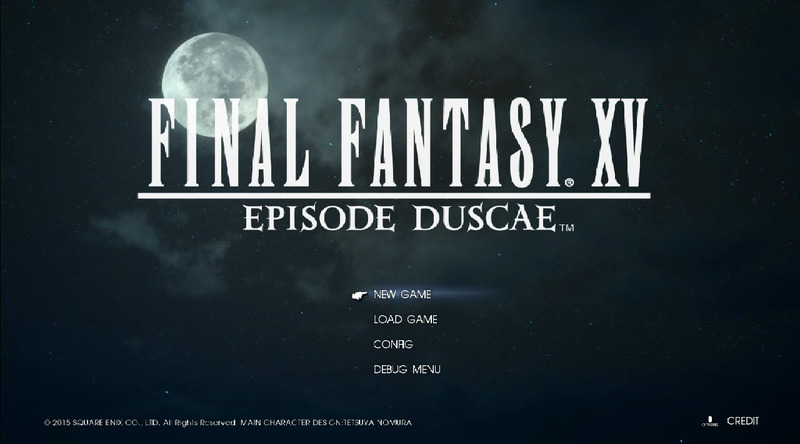 Square Enix gave a full rundown of the Final Fantasy XV: Episode Duscae demo included with early copies of Final Fantasy Type-0 HD during a special reveal live stream this morning. 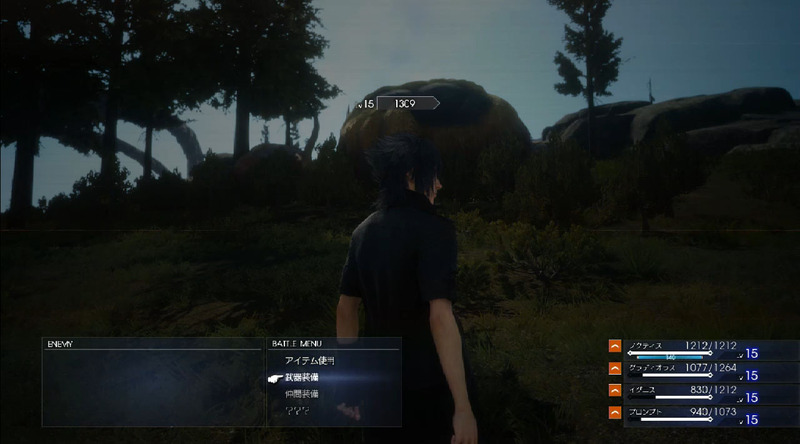 The broadcast featured Final Fantasy XV director Hajime Tabata, among a trio of other developers playing a live version of the demo on PlayStation 4. Get all the new information below. 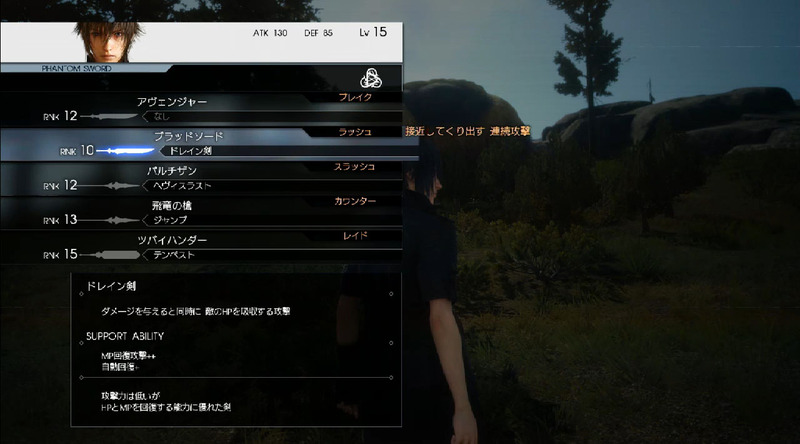 Players won’t be able to drive the car in the Episode Duscae demo (the “Drive” option is grayed out in the Travel Menu). Exploration will be done on foot. In the final version, there are times when you aren’t able to drive, but in the demo it’s cut. 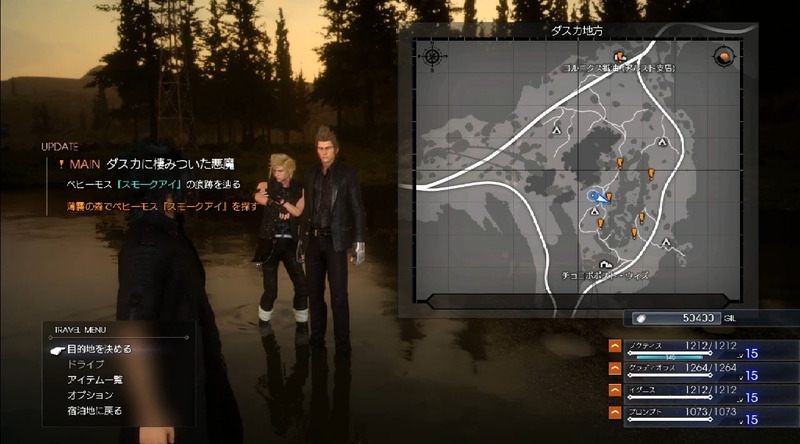 Tabata explains that in the demo, the car is being worked on, and the gang is trying to get money to pay for the repairs. The demo has an ending, which will take about three hours to reach. In addition to first-print retail copies of Final Fantasy Type-0 HD, the demo will also be included with the digital version (priced at 6,100 yen in Japan). The demo will be included with digital purchases made within the first two months of release. Shift (Warp) and Shift Break – Circle button / B button – Warp towards the locked-on enemy and attack. This consumes MP. Guard – L1 button / LB button – Avoid normal enemy attacks at the cost of MP. It’s a matter of timing. The blue light that shines when you evade is the MP being spent. 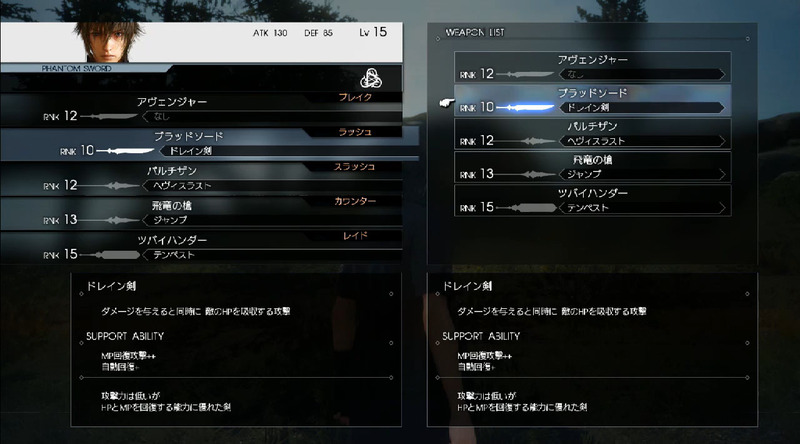 Ability – Triangle button / Y button – Each weapon has its own pre-set abilities. By using the X button / A button and left and right sticks, you can change the ability at any time without stopping the attack. MP is consumed when using abilities. The demo begins with the title screen, which moves in real time. Although the moon is displayed on the menu screen, it is morning when you start the demo. It should be noted that one day is equal to 45 minutes in the demo version. When encountering an enemy, a red gauge suddenly appears on the upper part of the screen. The gauge is activated only when an enemy is targeting the player. If you dash before the gauge is filled, it’s possible to avoid the battle. The battle background music generally doesn’t play when roaming the field, but when the red gauge is activated, the battle BGM will begin playing. The encounter gauge is invoked by some monsters. The enemy called Totetsu will chase the player so long as you’re on the field, while Garula will mind its own business until you provoke it. The battle style of Final Fantasy XV is basically attacking, avoiding enemy attacks by guarding, and then attacking again. When you run out of MP, it’s possible to recover your magic points by taking shelter in cover points. When the monster Garula was defeated, the party obtained its meat. Although useful when camping, it’s a strong beast, so tackling it early on might not be the smartest idea. Sometimes the enemy will shine according to the timing, and you have an opportunity to counterattack with parry. 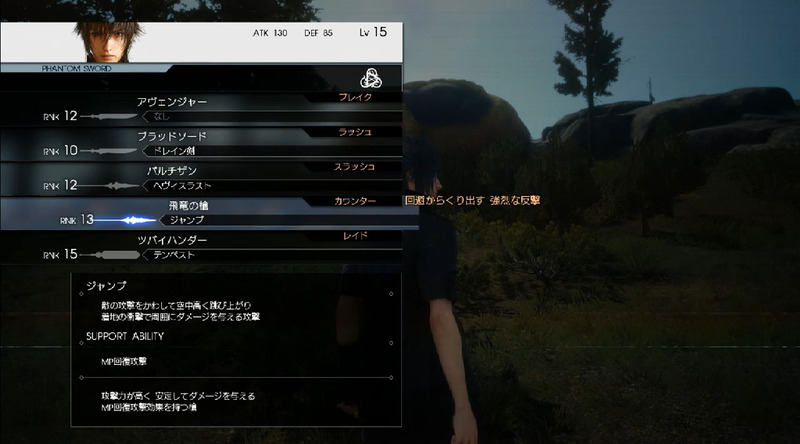 Players will be able to change Noctis’ equipment and use items. 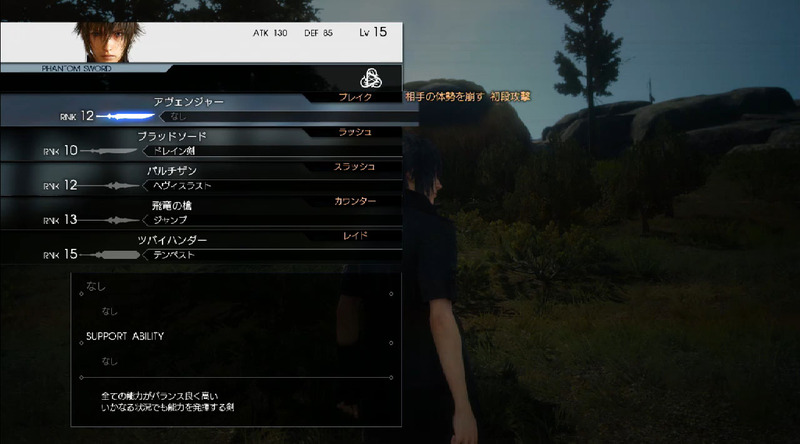 In the demo, you won’t be able to change the rest of your party’s equipment. Equipment has “Break,” “Rush,” “Slash,” “Counter,” and “Raid” labels. Break weapons are what you strike with first, while Rush weapons can be set for your continuous attacks after the initial strike. Speed, among other things, is an important factor when fighting enemies that have strong evasion performance. Battle tactics are created by changing your equipment according to the enemy you are fighting. When you’re not in battle, you can open the Travel Menu, through which you can check the map and determine your next location by changing the position of the marker on the map. The blue points on the map indicate gathering points. You can sell the items you’ve obtained for gil. The goal in the demo is to earn money to pay for your broken car repairs so you can get it back from the garage. 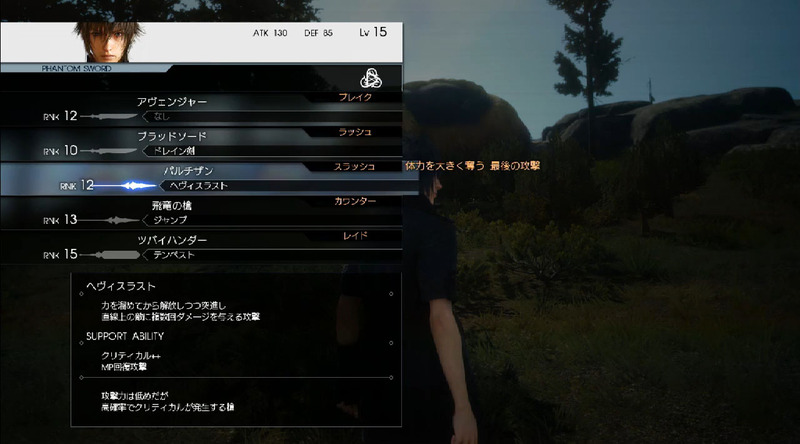 In the demo, Noctis is really poor. When you camp, Ignis can cook. 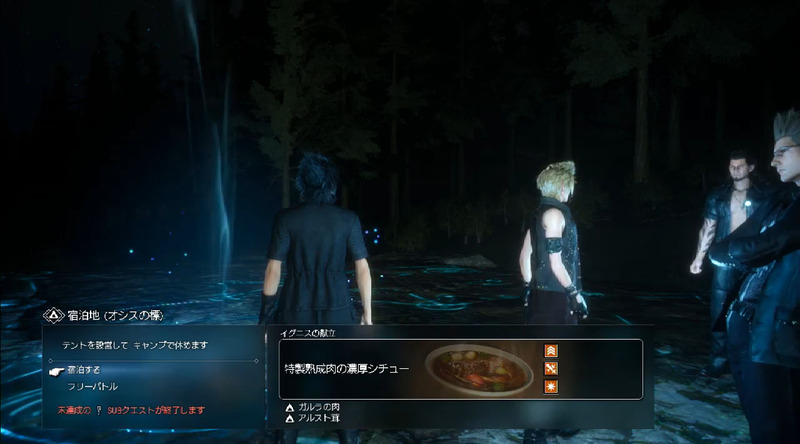 Depending on the food Ignis makes, the status buffs given to the party are different. 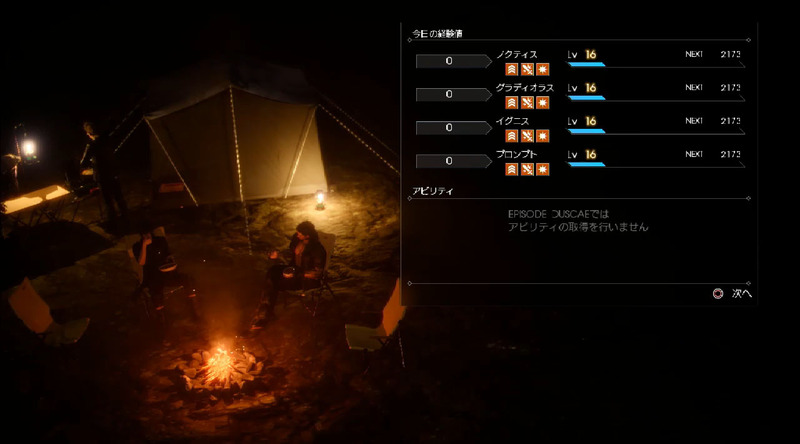 Players can also accumulate experience camping, and level up if they meet the necessary experience requirements. You won’t be able to level up outside of camp. After camping, the game will auto-save, and it will be morning. Once you camp at a location once, you can return to it at any time. 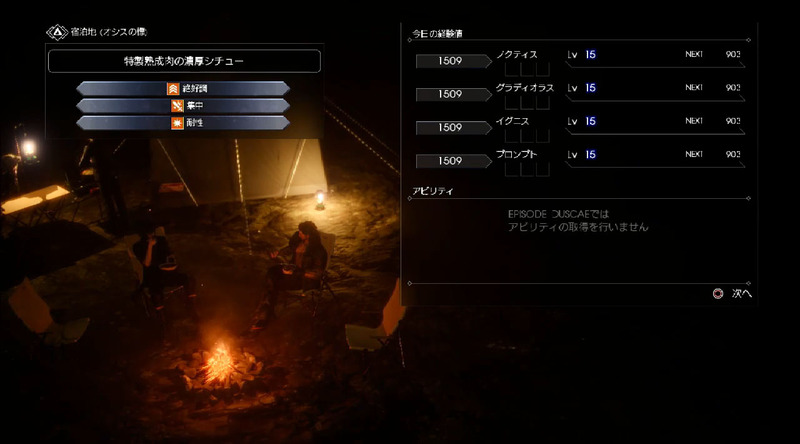 Since the status effects of eating become weaker depending on the number of days elapsed, it’s recommended players eat periodically while camping. If you defeat the Behemoth, who’s named “Smoke Eye” by the way, you’ll be awarded a huge prize. Nighttime is very dangerous. Monsters that do not lurk during the day, such as goblins, lurk during the night. And they’re no small fry, as they can steal your items and inflict you with poison status. 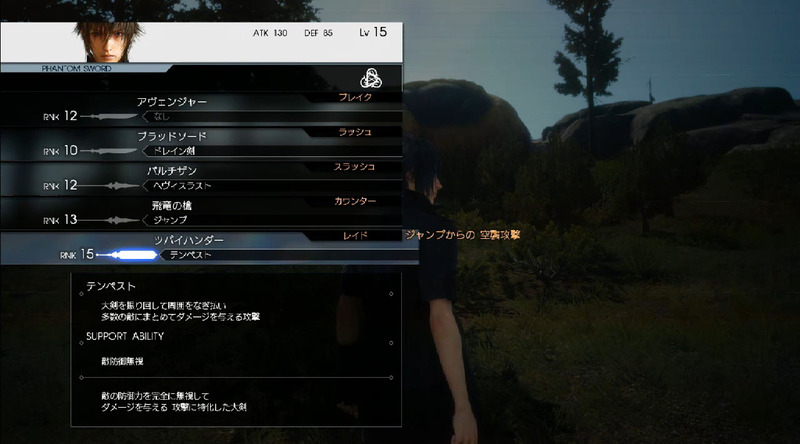 Game Over – You get a game over when Noctis is unable to battle. Even if your HP drops to 0, it doesn’t mean you aren’t able to battle. First you are in a “critical condition” status. In critical condition, a red gauge is displayed and if that gauge runs out, you’ll get a game over. Before the gauge depletes, you can use items or be healed by your companions. If you heal, you’ll be fine. Frame Rate – The demo doesn’t run at 1080p and 30 frames per second. Full HD is planned for the final version. Weather – The weather will not change in the trial version. Weather changes are planned for the full version. Weapons – The normal weapons you regularly use in battle are completely different than the Phantom Sword summon weapons. When you start the demo, you have regular weapons and those won’t increase, but you can obtain the Phantom Swords. The Phantom Swords are scattered around on the map, and you obtain them by searching. This is one of the extra elements outside of the story line. Cooperation – There is only one co-op move in the demo. The co-op moves are really strong. It disrupts the balance because they are gradually learned through growth. Side Elements – Side elements of the demo include searching for the Phantom Swords, as well as additional side elements that unlock after you reach the ending. Data Import – There will be no data importing from the demo to the retail version. However, it’s possible Square Enix will give players some sort of bonus for having the demo save data. Adamantoise – You won’t be able to battle the Adamantoise in the demo version. This is an element that’s being incorporated into the story. Airships – Regarding airships, they have not been abandoned. 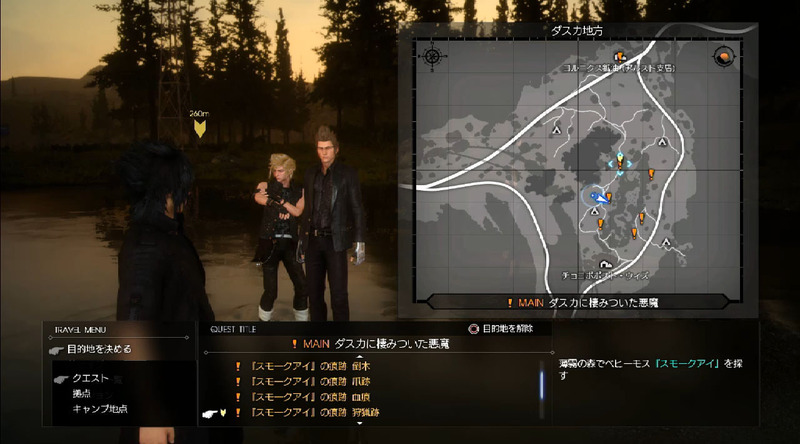 Tabata says he’ll talk about it more after the demo version is released. Ending – The ending of the demo touches on the story of the retail version. Development Status – The full version is 60 percent complete. It might not seem like too big of an increase from the game’s 55 percent completeness at the Tokyo Game Show, but the fact is it’s progressed a lot. Since the progress of game development isn’t finished up uniformly, there is a possibility it will increase quite a bit seemingly at once from here on out. Finally, you can see a bunch of screen captures from the new menus shown in the demo, as well as the footage itself, below. Thanks, Dengeki Online and Games Talk.